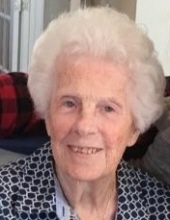 Lillian R. Emslie, 92, of Criddle Road in Sherman, PA, died of natural causes on Sunday, February 3, 2019 at her home. She moved to Sherman from Brooklyn with her husband John (Jack) Emslie in 1980. She is predeceased by her husband Jack and four sisters, Catherine Maichen, Margaret McCarthy, Veronica Davis, and Geneieve Davis. She is survived by several nieces and nephews. Lillian was a member of St. Joseph’s Church in Deposit and a member of The Catholic Daughters. She also volunteered at The Closet in Deposit. Viewing will be at Zacharias Funeral Home, 78 Second St., Deposit, NY on Wednesday, February 6, 2019 from 2:00 - 4:00 PM. A Service will be held at 2:00 PM with Fr. Dan Quinn officiating. To plant a tree in memory of Lillian R. Emslie, please visit our Tribute Store. "Email Address" would like to share the life celebration of Lillian R. Emslie. Click on the "link" to go to share a favorite memory or leave a condolence message for the family.